I think Jonathan King’s “Everyone’s Gone to the Moon,” which reached the Top 4 spot in the UK pop charts in late July 1965, is a beautiful song; its aching melancholy has haunted me for decades. I must have been around eleven years old when I first heard it, and I simply can't shake it off. But what is it about? Like a startling image from a strange dream, it remains firmly lodged in my memory, because its strangeness is precisely what makes it so difficult to forget. Many people, I’ve found, have had an odd or unusual dream that they’ve never been able to forget, primarily because they’ve never been able to explain it satisfactorily, if at all. Unreality—“a universe of uniform precision and clarity but devoid of the dynamism, emotional resonance, and sense of human purpose that are characteristic of everyday life” (47). 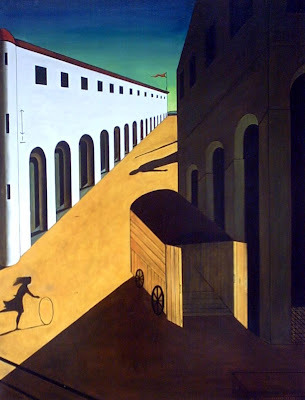 In order to illustrate the experience of Unreality, Sass cites the memoir of a schizophrenic named “Renee” to sufficiently capture the disturbing nature of the changed world: “It was...a country, opposed to Reality, where reigned an implacable light, blinding, leaving no place for shadow; an immense space without boundary, limitless, flat; a mineral, lunar country, cold as the wastes of the North Pole” (47). Fragmentation—“Objects normally perceived as parts of larger complexes may seem strangely isolated, disconnected from each other and devoid of encompassing context; or a single object may lose its perceptual integrity and disintegrate into a disunity of parts.... Another schizophrenic likened his vision of Fragmentation to being ‘surrounded by a multitude of meaningless details.’ ‘I did not see things as a whole,’ he said, ‘I only saw fragments: a few people, a dairy, a dreary house’ (49-50). Apophany—From the Greek word apophany, meaning “to become manifest.” “Once conventional meanings have faded away (Unreality) and new details or aspects of the world have been thrust into awareness (Fragmentation, Mere Being), there often emerges an inchoate sense of the as yet unarticulated significances of these newly emergent phenomena. 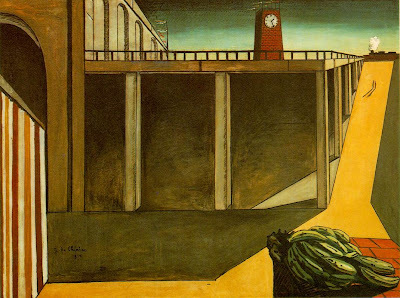 In this “mood,” so eerily captured in both the writings and the paintings of de Chirico, the world resonates with a fugitive significance. Every detail and event takes on an excrutiating distinctness, specialness, and peculiarity—some definite meaning that always lies just out of reach, however, where it eludes all attempts to grasp or specify it” (52). In short, every single image implies an elusive “meaning” that lies "just out of reach." What is the peculiar specialness, elusiveness, meaning of the utterance, Arms that can only lift a spoon? Decadent, effete behavior? An effect of life in zero-gravity, of living in outer space? The arm of a drug addict (the spoon associated with the intravenous administration of heroin)? Infantile behavior, in the sense that the spoon is the first utensil employed by humans ("spoon-fed")? Hence "Everyone's Gone to the Moon" might be best understood as a sort of cubist or futurist collage, a heteroclite mélange of "perspectival fluctuations" very similar, as Sass would argue, "to what occurs with schizophrenia" (138). This song has always haunted me too, but as I take the time to examine the lyrics, my own take on it is quite different, and simpler, than yours. To my thinking, the song sketches a moment in Swinging London's history when the scene began to darken as harder drugs than marijuana, like cocaine and heroin, came into fashion. Consequently the lyrics are organized to depict various pleasures in contrast with their own cancellation or contradiction, painting a world of plenty that still exists but is beyond the reach of people who are perpetually zonked (eg., "gone to the moon"), with strength enough only to "lift a spoon." It could even be a criticism of then-fashionable acid rock, given the lines about how "long time ago, life had begun - everyone went to the sun," which reads to me as an allusion to Brian Wilson, The Beach Boys, and their fun- and life-affirming brand of rock. Indeed, given the fact that The Beach Boys were contemporaneously releasing their masterpiece PET SOUNDS, criticized at the time as too downbeat by some, the song could almost be interpreted as a direct criticism of the "moon" music emerging from Brian Wilson's withdrawal into coke and LSD. Hadn't thought of this still I started typing this paragraph. Thanks again for such a mentally stimulating blog! I came across your blog upon using keywords "Stimmung Sass" in Google. "Madness and Modernism" is indeed a wonderful book!